l specialize in custom carpentry and in building unique features in wood and other materials for your home. I take pride in the high quality of my craftsmanship. A piece of fine furniture or millwork begins with the very highest quality to ensure best results. I love wood and the different characters and inner beauty of different types. I take wood from its raw state and bring it to life in new states as I transform each piece, using a wide range of tools and techniques in the tradition of old-world craftsmen. I have several reliable sources of wood suppliers that meet my standards. 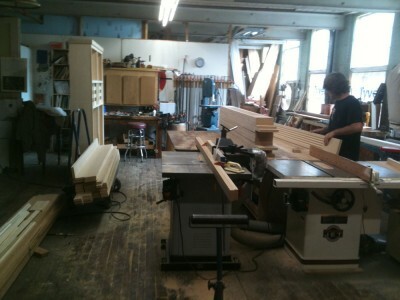 I also pick up trees to custom saw into lumber and dry to furniture-grade material. I am a master carpenter with 30-plus years of woodworking experience on large and small residential projects. My mission is to recreate and restore spaces in homes to meet your needs and to craft unique furniture, cabinets and architectural features of the highest quality. I build relationships with my customers based upon high standards of craftsmanship, trust and reliability. My workshop is located at 133 Hartford Road, East Granby, CT. My work can be found in homes throughout Connecticut, including Suffield, West Hartford, Glastonbury, Bloomfield, Farmington, Avon, Simsbury, Granby, Collinsville, Colebrook, Norfolk, Litchfield, Kent and Salisbury, as well as in Stockbridge and Great Barrington, MA. Visit my workshop, or I will be happy to come to your home or office to plan your project. Tony in his workshop with a custom-built dining room set. Another view of the machinery and materials in Tony's workshop. A spiral staircase built by Tony. Some of Tony's tools at work.